Description Of Item: When Old Bones needs to lay down the law on his underlings, he calls upon the ultimate enforcer: Whiplash, Evil Tail-thrashing Warrior! 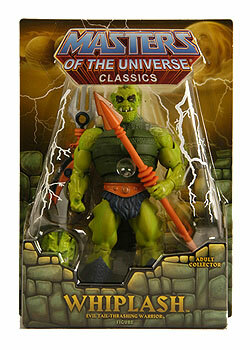 Sculpted by The Four Horsemen, Whiplash features an articulated tail that rotates a full 360 degrees so he?s ready to deliver his devastating blow anytime, anywhere. And, for ultimate customization, he arrives with weapons and both modern and vintage heads.